YECAPIXTLA, Mexico, Feb 01 (IPS) - Social organisations in the central Mexican municipality of Yecapixtla managed to halt the construction of a large thermoelectric plant in the town and are now designing a project to convert the installation into a solar panel factory, which would bring the area socioeconomic and environmental dividends. Antonio Sarmiento, from the Institute of Mathematics of the National Autonomous University of Mexico, outlined the idea when the state-run Federal Electricity Commission (CFE) launched the construction of the Morelos Integral Project (PIM), which consists of a gas and steam generating plant, a gas pipeline that crosses the states of Morelos, Puebla and Tlaxcala, and an aqueduct. "The plant can be reconverted. There are alternative uses. It can generate significant economic development in the region and make energy change possible," the expert told IPS, estimating that an investment of some 260 million dollars would be needed. Sarmiento calculates that the use of half of the area of the Central Combined Cycle Power Plant, which covers 49 hectares in the community of Huexca and has a capacity of 620 megawatts (MW), would permit the installation of solar panels, the planting of crops under the panels, and a factory to produce them. "Agrophotovoltaic technology" takes advantage of the water that condenses on the panels, which drips onto the crops below, before it can evaporate – technology that is already used in Germany and other nations. In addition, farmers can use solar-powered irrigation pumps to access water from wells. For this area of solar cells, with a useful life of 25 years, the generation would total 359 MW-hour per day, which would meet the consumption needs of 34,278 households. The electricity generated would supply the municipality and replace energy from fossil fuel-powered plants, the academic explained. Huexca, home to the thermoelectric plant that is no longer being built, about 100 kilometers south of Mexico City, has some 1,000 inhabitants, mostly Nahua Indians, part of the total 52,000 people living in Yecapixtla. The transformation would reduce gas consumption, methane leakage, massive use of water, the generation of liquid waste and the release into the atmosphere of nitrous oxide, which causes acid rain that contaminates the soil and destroys crops. 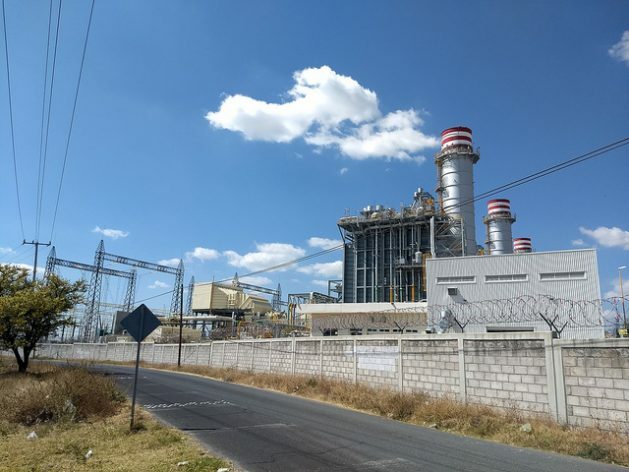 By means of several judicial injunctions, the People's Front in Defence of Land and Water in Morelos, Puebla and Tlaxcala and its ally, the Permanent Assembly of the Peoples of Morelos (APPM), have blocked the completion of the power plant and 12-kilometer aqueduct, as well as the start of operations of the 171-kilometer gas pipeline. Huexca and other Nahua peasant communities, through legal action brought at the start of the construction of the power plant in 2012, managed to stop construction of the pipeline in 2017 for violating indigenous rights. In addition, groups of "ejidatarios" - people who live on "ejidos" or rural property held communally under a system of land tenure that combines communal ownership with individual use - blocked the extraction of water from the nearby Cuautla River to cool the turbines of the plant in 2015, and the People's Front secured, early this year, the suspension of the discharge of treated water into the river. Opponents of the power plant also resorted to protests and roadblocks to bring to a halt a project that affects more than 900,000 people, including 50,000 indigenous people from 37 indigenous tribes, according to a 2018 estimate by the autonomous governmental National Human Rights Commission. Now, they want leftist President Andrés Manuel López Obrador, who took office on Dec. 1, to cancel the Morelos Integral Project and reach an agreement with the local population on the fate of the plant. "We don't want the thermoelectric plant to operate, because it's going to cause irreparable damage. If the solar plant is viable, go ahead. Or they could turn it into a university, so our children don't have to travel long distances to study and expose themselves to violent crime. Something worthwhile should be installed," activist Teresa Castellanos told IPS. Castellanos, a member of the APPM, has been involved in the battle against the plant from the beginning, which has earned her persecution and threats. For her activism, she won the Prize for Women's Creativity in Rural Life 2018, awarded by the Geneva-based non-governmental Women's World Summit Foundation. The opposition to the plant by the affected communities, who make a living growing corn, beans, squash and tomatoes and raising cattle and pigs, focuses on the lack of consultation, the threat to their crops due to the extraction of water from the rivers, and the dumping of liquid waste. In the first half of 2018, Mexico had a total installed capacity of 75,918 MW, of which 23,874 MW come from clean technologies. The capacity of clean sources grew almost 12 percent with respect to the first half of the previous year. Mexico assumed a clean electricity generation goal of 25 percent by 2018, including gas flaring and large hydroelectric dams; 30 percent by 2021; and 35 percent by 2024. But the reality is that the renewable matrix is only around seven percent, although it could reach 21 percent by 2030 with policies aimed at fomenting it, according to data from the International Renewable Energy Agency (Irena). By 2021, more than 200 clean energy generators are to come into operation, generating 19,500 MW. Of these 200, 136 are solar and 44 depend on wind power, according to the Energy Regulatory Commission. As López Obrador reiterated during the election campaign, his energy plan consists of the construction of a refinery in the southeastern state of Tabasco, the upgrading of the National Refinery System's six processing plants and of 60 hydroelectric plants, as well as investment in solar energy. The president continues to refuse to close plants of the state generator CFE, due to the need to meet the growing energy demand of this Latin American nation of 129 million people, the second largest economy in Latin America. According to government investment projects for 2019, state-owned oil giant Pemex would have at its disposal about 24 billion dollars for oil exploration and extraction, the overhaul of six refineries and the start of construction of another. For its part, the CFE will be able to spend some 23 billion dollars on projects such as the renovation of 60 hydroelectric plants and the development of solar energy. The solar panel factory that is proposed as an alternative for Huexca, could, in fact, cover a significant deficit in technology and inputs in the solar energy sector in Mexico, say experts. López Obrador plans to visit the area on Feb. 11 and has requested that a file be put together on the generator in order to decide the future of a construction project which so far has cost around one billion dollars. The local population does not want to see seven years of struggle against the plant go to waste. "We need alternatives. We voted for López Obrador, he can't let us down. We are only demanding respect for our right to life," said Castellanos, the activist. For Sarmiento, the academic, the environmental and health damages would be greater if the plant goes into operation. "The maintenance of the plant will be more expensive than solar generation. And what will happen when it reaches the end of its useful life? It will be useless," he said. Meanwhile, the inactive smokestacks of the unfinished plant are waiting for a signal to belch out smoke and the electric pylons are rusting with no power to transport. Perhaps they never will, if the local residents have their say.